You’ll find us outside the Nutty Wizard every Saturday morning, at the junction of Cliffe High Street and South Street. From March we’re there from 9.30am until 12.30pm. 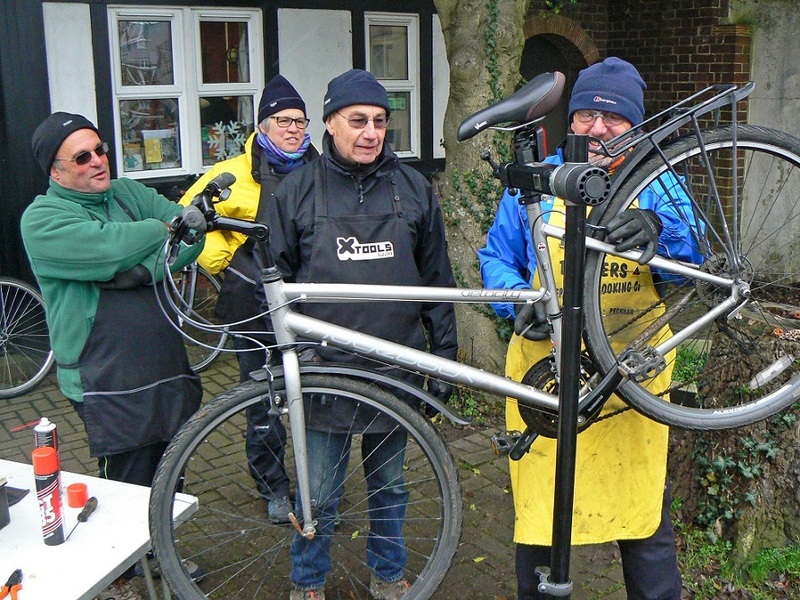 Dr Bike is a group of cycle enthusiasts who want to help local people to use their bikes more. 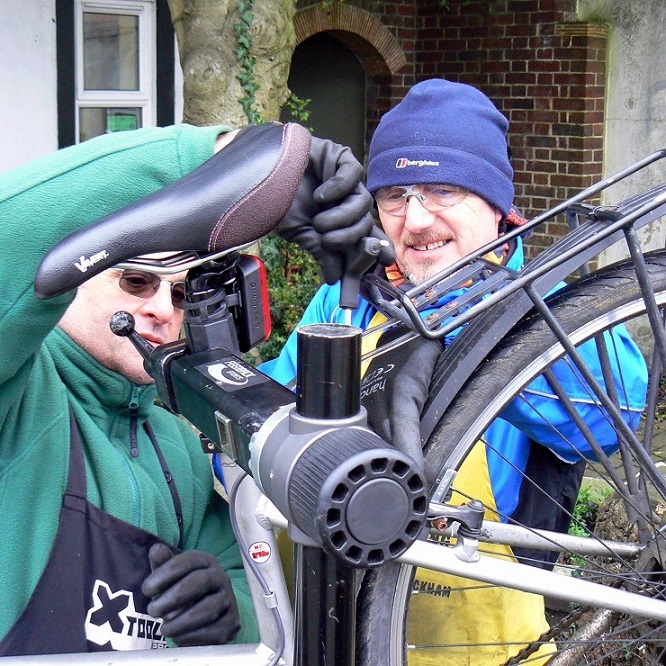 We offer friendly help to cyclists who have fairly basic bikes that are in need of first aid. Most bikes go wrong because they haven’t been maintained: cables seize up through lack of oil, brake blocks wear out, gears go out of adjustment or tyres go flat. We can even sometimes unbuckle a wheel but that depends on the state of the spokes. 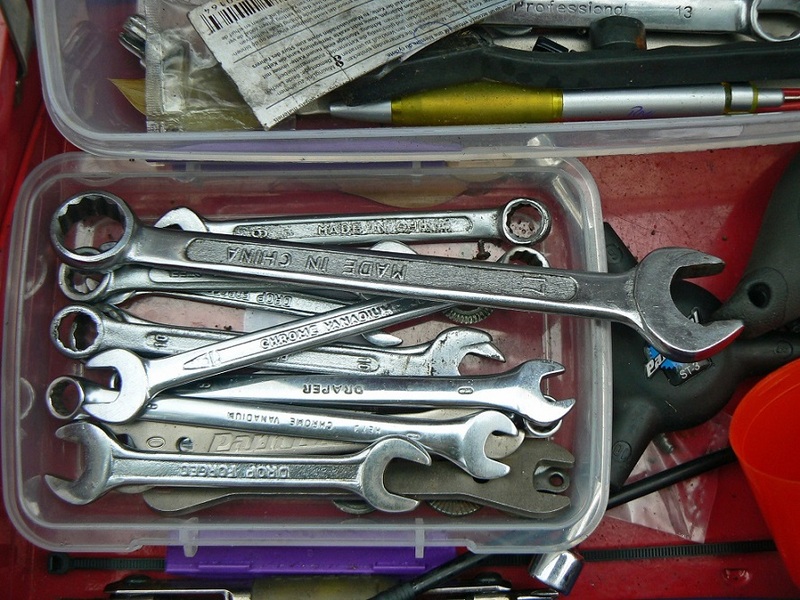 Higher-end bikes or those needing more complicated repairs are better served by Lewes’s two Cycle Shack outlets. At the moment there are around eight Dr Bikers in total, usually with three or four volunteers on duty each week. 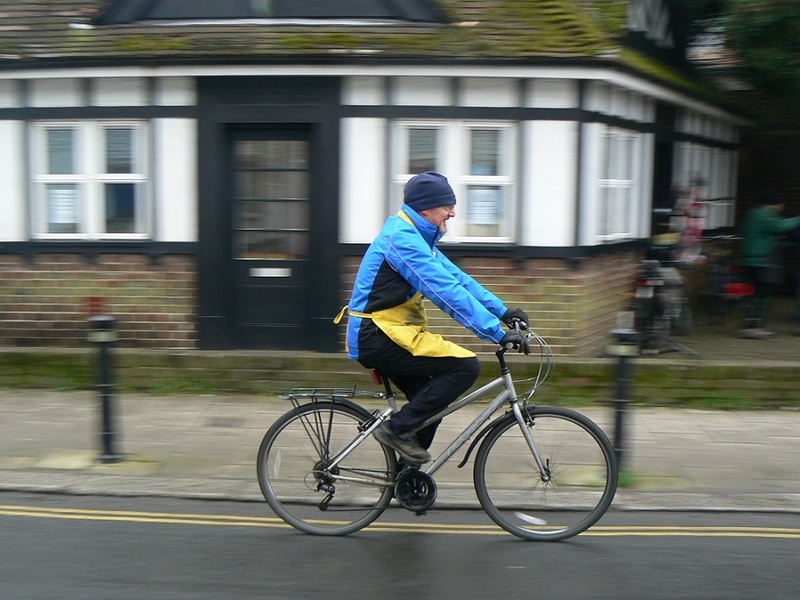 The service began in 1991, shortly after the first Lewes Green Wheels Day to encourage the use of sustainable transport. Pete Barnes and Chris Franks were the two original ‘doctors’. They were based outside Fitzroy House, the old library building opposite Boots, which is where Chris lived at the time. By 2014 Chris had moved away and the Farmers Market was being held on the precinct twice a month, so we moved our surgery to the Nutty Wizard building. I’ve been told the Nutty Wizard was originally a public toilet before it was converted. It now hosts a youth club, book swaps days, language lessons, an occasional cafe and much more. Dr Bike helps support all this with any extra money we’re given. We only charge trade prices for the parts we supply. Customers can make a donation for our labour, which pays for our insurance, tools and rent. Our most important piece of kit is the work stand, which holds a bike up in the air so the wheels can rotate. It means we can fix gears, brakes and punctures without getting a bad back. We’ve got a well-stocked tool box, puncture repair kits, cable inners and outers, brake blocks and, most importantly, lots of good oil. I started volunteering in November 2013. I’d previously worked in the fire service with one of the other Dr Bikers but now I am a cycle trainer for East Sussex County Council, teaching Bikeability; a road-based version of the old Cycling Proficiency Test. Whatever your views on global warming and green travel, cycling will make you fitter and is more fun – especially when you can pedal past traffic jams on our ever-expanding cycle route network. I often find I can actually get somewhere quicker by bike than by driving, so it’s win-win. If the only thing preventing you from cycling more is a poorly bike, then maybe it’s time to take it to the doctors!